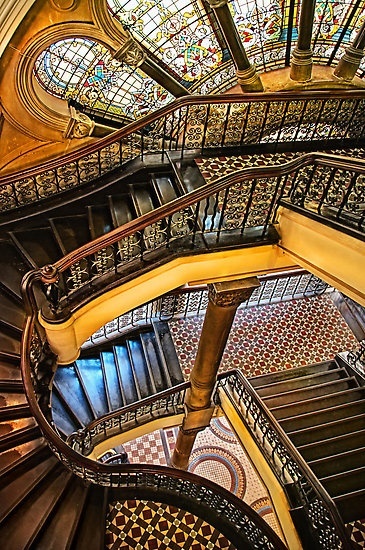 The Queen Victoria Building (or QVB), is a late nineteenth-century building designed by the architect George McRae in the central business district of Sydney, Australia. The Romanesque Revival building was constructed between 1893 and 1898 and is 30 m (98 ft) wide by 190 m (620 ft) long. The building fills a city block bounded by George, Market, York and Druitt Streets. Designed as a shopping centre, it was later used for a variety of other purposes until its restoration and return to its original use in the late twentieth century. Two mechanical clocks, each one featuring dioramas and moving figures from moments in history, can be seen from the adjacent railed walkways. The Royal Clock activates on the hour and displays six scenes of English royalty (accompanied by a trumpet voluntary written by Jeremiah Clarke). The Great Australian Clock, designed and made by Chris Cook, weighs four tonnes and stands ten metres tall. It includes 33 scenes from Australian history, seen from both Aboriginal and European perspectives. An Aboriginal hunter circles the exterior of the clock continuously, representing the never-ending passage of time.